Some of the simplest joys in life can be got within one day, from sunrise to sunset. We had reached the Grand Canyon the night before and having booked early enough found reservations at the Holiday Inn within 2 miles from the park entrance. What was supposed to be an early day for two of us turned out to be an early rise for everyone. We rushed to Mather Point, 5 miles into the park and by 5:30 we were ready for the sun to rise. As the sun came up from behind the canyon rim, the dark shadows in the canyon started to show us their true colors. We were hooked. The day was just beginning, it was not even 6 am and we were already in love. It is true what they say. It is much more. The Grand Canyon National Park, is an UNESCO World Heritage Site, and is spread over a million acres and lies on the Colorado Plateau in northwestern Arizona. It is on average over 4000 feet deep, sometimes even over 6000 feet. It is over 277 miles long and 15 miles wide at the widest. These are numbers and as much as they speak of the magnitude, and as much as these photos might reveal, you have no idea how big it is until you see it. Even though the park is supposed to be a semi-arid desert, 5 of the 7 life zones exist here and 3 of the 4 desert types in North America is here. It is home to plants, birds, mammals, reptiles, amphibians and fishes. 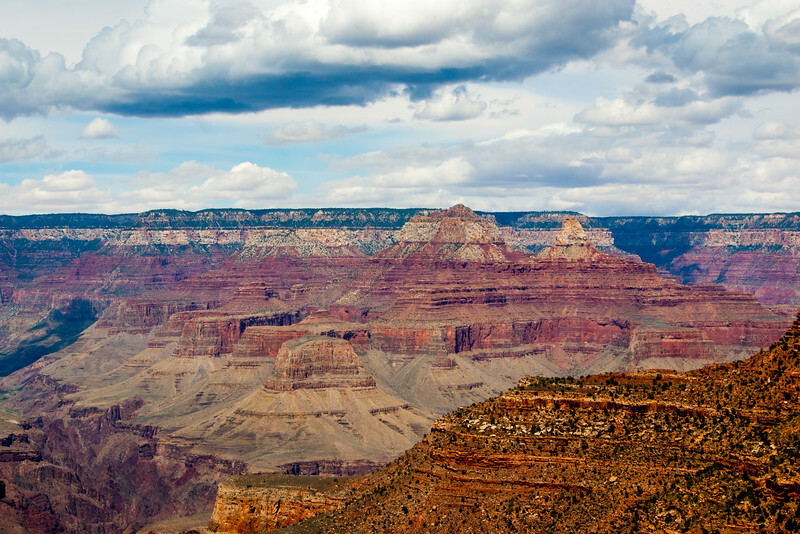 The entire gamut of life can be found here in the Grand Canyon. Formed over millions of years, the Colorado River and its tributaries have cut through layer after layer of sediment as the Colorado Plateaus have been uplifted. Geologically it is significant because of the thick sequence of ancient rocks that are beautifully preserved and exposed in the walls of the canyon. These rock layers record much of the early geologic history of the North American continent. 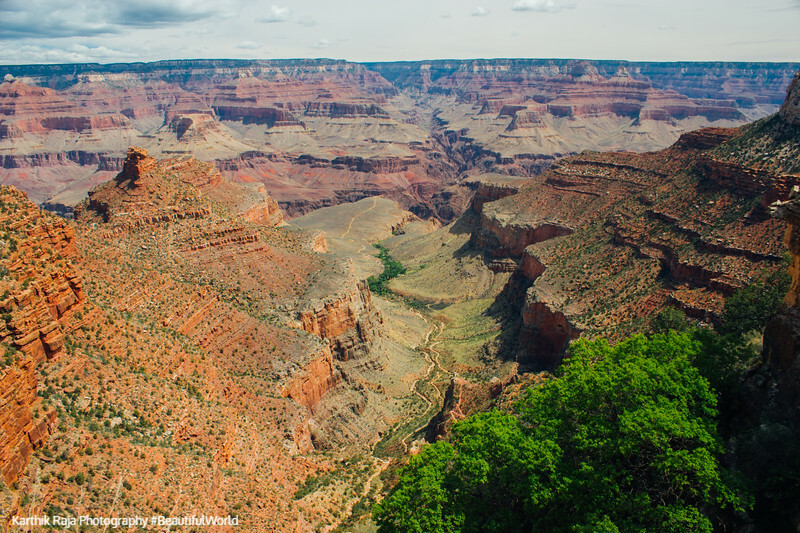 Although first afforded Federal protection in 1893 as a Forest Reserve and later as a National Monument, Grand Canyon did not achieve National Park status until 1919, three years after the creation of the National Park Service. Today Grand Canyon National Park receives close to five million visitors each year – a far cry from the annual visitation of 44,173 which the park received in 1919. We returned to the hotel, ate our breakfast, and headed back to the canyon to hike. We began our hike at 10:15 at the Bright Angel Trail, delayed partly by our over-excitement, and as we trekked down into the gorge we realized how huge this is. As we went a few hundred feet down, we saw more of the canyon open up and we knew this trek as hard as it was going to be, was something we’d never forget. We saw animals in the cliffs and that made this canyon a living paradise. We took regular breaks and in 2 hours we were at the 3 mile rest stop. 3 miles and 2112 feet down into the canyon. We wanted to carry on to the Indian Garden, but time was not on our side. So we started the more difficult hike back up after a good 30 minute stop. We stopped more often on the way up, not only because we had to but because we knew once we were back up these views would be lost. After 5.5 hours we were back at the top. Take a lot of water and food on the hike as it gets hot and there are no restaurants. It is just you against the canyon. We got a fast and ravenous lunch at our favorite We Cook Pizza and Pasta restaurant and then headed to Desert View, 27 miles away on the South rim. From here you can see the desert that surrounds the canyon, the mountains that stand above it, the gorges that are carved steep into it and the river that continuously takes pieces out of it. The tower that would have given us a greater view was closed. Building a structure that provides the widest possible view of the Grand Canyon and yet harmonizes with its setting was architect Mary Colter‘s goal when the Santa Fe Railroad hired her in 1930 to design the tower at Desert View Point. The Watchtower opened in May of 1933. Having soaked it all up, we then had to rush back to catch the sunset. We did stop at the Tusayan Ruin and saw the ancient Indian ruins and also a grand view of the San Francisco peaks. We then parked at Yavapai point to see the sun set over the canyon. We had risen early for the sunrise, we had taken photos of the canyon, we had hiked the canyon, we had seen all the views from all the points but here we were standing in awe as the sun played with the canyons lighting it and hiding it alternatively in its own shadows. Unbelievable! We watched, ran from view to view not wanting to miss anything. As the sun plummeted out of sight, we knew we had to head back to Phoenix. We stayed for a while longer, taking deep breaths and not blinking for minutes. This was it. Phoenix was 4 hours away and some slept and dreamed of the Grand Canyon while others just kept turning back. At 12:30 am the next day we fell asleep.